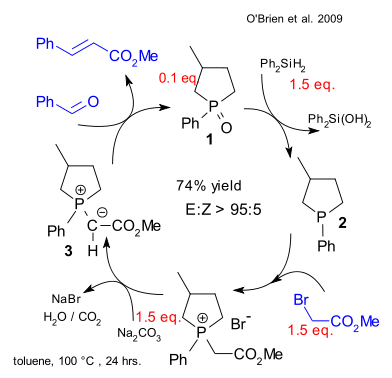 The Wittig reaction discovered in 1954 by George Wittig couples ketones and aldehydes with phosponium ylides to alkenes. Although this organic reaction is extensively used in organic chemistry it suffers from one major drawback: removal of the phosphonium oxide waste product. O'Brien et al. think they have the solution: a Wittig reaction that is catalytic in the ylide (DOI). This is how their catalytic Wittig works: phosphonium oxide 1 (cyclic and therefore more reactive) can be easily reduced by diphenylsilane forming diphenylsilanediol and phosphine 2. This phosphine reacts with an alkyl halide such as methyl bromoacete and then with base (sodium carbonate) to the phosphonium ylide 3 which then reacts with benzaldehyde to methyl cinnamate. The phosphine oxide is regenerated and the catalytic cycle restarts. Thus far only Ph2SiH2 was found selective enough not to mess with the aldehyde or the substrate. Painful removal of the silanol via flash chromatography is still required but no doubt the hunt is on for more convenient reducing agents.